During my third visit to Peru (June 19-July 18, 2014), our family group of eight Dempseys trekked vigorously 10 days Around Alpamayo in the Cordillera Blanca and 9 days on the spectacular Cordillera Huayhuash Circuit, in the Huaraz area, Andes, South America. We prepared for the breathtaking altitudes with three day hikes of acclimatization out of Huaraz: 1) Callan Punta (in the Cordillera Negra), 2) Lake Churup, and 3) Lake 69. The tough itinerary was rewarded by memorable images shown below. We booked our treks of 2014, 2003, and 2000 directly via e-mail and wire payment using the excellent Peru-based trekking company Aventura Quechua. (See my earlier article PERU 2000, 2003.) Our group enjoyed their good food and confident leadership on tenting treks with guide, cook, and arrieros (donkey wranglers). Experienced, flexible trip leader Dante successfully guided our 22 days of hiking in 2014. Peru is one of the best exotic travel bargains from the USA (much closer than Nepal). Visitors from the Americas will have little jet lag to Lima because Peru Time (PET) equals Eastern Standard Time (EST) without a Daylight Savings shift. Cordillera Blanca is the highest tropical mountain range in the world, reaching 22,205 feet at the top of snowy twin-peaked Huascaran. In 1985, UNESCO listed beautiful Huascaran National Park as a World Heritage Area, a label for special places worth seeking worldwide. Trekking around the stunning Cordillera Huayhuash requires altitude acclimatization and good physical fitness. We averaged walking about 9 miles and 2000 feet up/down each day in good weather. Donkeys carried gear and arrieros (donkey drivers) set up camp ahead each day, leaving us to carry light day packs. We crossed many passes over 15,000 feet in elevation above sea level reaching as high as 16,500 feet. The scenery and thin air took my breath away! The Cordillera Huayhuash challenged mountaineers in the gripping 2003 British docudrama “Touching the Void.” In 1985, climbers Joe Simpson and Simon Yates scaled the treacherous West Face of Siula Grande (20,800 feet / 6344 meters), one of the last unconquered faces in the Andes, but after Joe broke his leg, their descent became one of the most amazing survival stories in mountaineering history. The movie is based upon the harrowing book, “Touching the Void: The True Story of One Man’s Miraculous Survival ” by Joe Simpson (published 2004, 1993, 1989). While Lake Titicaca (on the border with Bolivia) is an earlier and more important cradle of Andean civilizations, Cuzco Valley gave birth to the powerful Inca Empire. Peru’s greatest native legacy to the world is the potato plant, which is now a staple crop spread world wide. Archeology suggests that in a 700-800 AD military expansion, the Wari people may have settled the Cuzco Valley and become the Inca’s ancestors. Quechua oral history says that the first Inca, Manco Capac, the son of the sun god (inti), founded the city of Cuzco in the 1100’s AD. After 1430 AD, the Incas burst out of Cuzco and quickly imposed their culture from southern Colombia to central Chile. The Incas used their absolute rule and organizational genius to build vast terraces for growing food on the steep Andes mountains in a moderate climate, away from the dry desert coast and above the mosquito-filled Amazon Basin. The Incas developed textiles, pottery, metals, architecture, amazingly fitted rock walls, empire-wide roads, bridges, and irrigation, but never discovered the wheel, arch, or writing. Despite their amazing accomplishments, the Inca Empire lasted barely a century. Over in Europe, Catholic Pope Alexander divided Africa and Brazil to Portugal, and gave the Americas to Spain. With Church approval, Spanish fortune hunters accompanied by priests sought riches in the Americas. With lucky timing, conquistador Francisco Pizarro arrived in 1532 at a moment that found the Incas vulnerable from a just-ended civil war. With just a few dozen conquistadors bringing superior weaponry, horses, and guile, Pizarro captured the Inca Emperor Atahualpa at Cajamarca. Despite receiving a fabulous a gold-filled room as ransom fulfillment, Pizarro soon killed Atahualpa. After realizing that the Spanish were here to stay, the successor Inca Emperor, Manco, met with fellow Inca chiefs at Lares in spring 1536 to plan a rebellion, raising an army of 100,000 to 200,000 to surround Cuzco against just 190 Spaniards (including 80 on horses). Despite vastly superior numbers, their clubs, spears, slingshots, and arrows were no match against armored and mounted Spanish Conquistadors brandishing steel swords. Manco Inca’s rebellion was ultimately unsuccessful, and he was forced to retreat to Vilcabamba in the Amazon jungle, where he was killed in 1544. In 1572, the Inca Tupac Amaru organized another rebellion, but was also defeated and executed by the Spaniards. The Spanish Conquest lasted 40 years, from the ambush of Inca Atahualpa at Cajamarca, to Tupac Amaru’s beheading. Sadly, the near-socialistic support system of the Inca was now destroyed by the cruelty of feudal Europe. The “Indians” (now known as Andeans or campesinos) were now triply-exploited by 1) their native chief (curaca), 2) their Spanish governor (encomendero), and 3) their Spanish priest, who all exacted undue tribute payments. The Incas’ mita system of forced labor for the common good was misused by the Spanish for mining gold and silver for the Crown. Eventually the Spanish forced 80% of the former Inca Empire to work for tribute, mines, or textile mills, stopping just short of slavery. After the Spanish Conquest, Peru’s population declined from 7 million to 1.8 million due to disease, war, famine, culture shock, and demoralization. Read The Conquest of the Incas (2003), first published in 1970 by John Hemming. Today, despite turbulent politics, Peru makes a wonderful vacation. Allow one or two extra flex days in your schedule to handle delays in transportation due to frequent strikes. Search for latest “Peru travel books” at Amazon.com. Lonely Planet Peru (Travel Guide 2013) gives detailed itineraries, specific lodging, transportation and sights, great for planning and using on the trip. DK Eyewitness Travel Guide: Peru (2014) is great for initial trip planning and as a handsome (heavy color paper) souvenir left at home. Ascending too quickly above 10,000 feet elevation can cause nausea, headaches, or sleeplessness due to acute mountain sickness (AMS, altitude sickness, or soroche in Spanish). The best way to acclimatize above 10,000 feet elevation is to stay hydrated and to “climb high, sleep low.” That is, moderately day-hike to elevations higher than 10,000 feet, but then each night sleep no more than 2000 feet (600 meters) higher than the previous night. Avoid over-exertion for the first 1-2 days after arriving at altitude. According to the Institute for Altitude Medicine at Telluride, “avoid use of alcohol or sleeping agents of the benzodiazepine family, since they both suppress breathing and lower blood oxygen. Other sleeping pills like Ambien or Lunesta do not affect breathing at high altitude and are safe.” How fast you acclimatize is unpredictable and can vary for the same person on different occasions. Descending quickly towards sea level is the best cure if you become altitude sick. Take time to naturally adjust to higher altitudes without relying on a drug with side affects such as Diamox — compare with the safer Ginkgo Biloba herb or ibuprofen below. According to a significant study in 2010, over-the-counter ibuprofen is just as effective as prescription Diamox (acetazolamide) for prevention of high altitude headache. If tight trip schedules restrict time available for safe acclimatization, consider ibuprofen or the natural herb Ginkgo Biloba , which are both widely available without a prescription and have fewer undesirable side effects than Diamox (Acetazolamide, the drug most commonly prescribed by doctors for preventing altitude sickness). Common side effects of Diamox include frequent urination (risks dehydration), numbness and tingling in fingers and toes, taste alterations, blurred vision, and risk of kidney stones. Ginkgo Biloba may not be as effective as ibuprofen or Diamox. Ginkgo Biloba may interact with some other drugs, but the interaction with Diamox is unknown. Pregnant women and people taking antidepressants should first consult their doctor before using Ginkgo Biloba. Starting at sea level, my sleep was significantly better in my first 2 nights in Cuzco (at 11,000 feet) when taking Ginkgo Biloba herb in 2003, compared to my trip in year 2000 without the herb. On our high altitude Huayhuash Trek in the Andes of Peru, most of our group of 11 men took 120 milligrams of Ginkgo Biloba herb twice a day starting 5 days before ascending, and no one experienced serious problems from mountain sickness. In Nepal, we extended acclimatization time by first trekking Annapurna Sanctuary before the higher Gokyo Valley (Mount Everest area) and felt no significant altitude problems. My wife says she feels more comfortable at altitude after using Ginkgo Biloba as described above. A public bus from Lima drove from sea level over a 13,400-foot pass and down to Huaraz at 10,000 feet elevation. We crossed a 14,900-foot pass twice on a bus tour to Chavin at 10,360 feet elevation on the other side of the Andes. We drove to 13,400 feet and hiked downhill 10 miles to Huaraz. How high can humans live? At 18,000 feet you breath only half the oxygen compared to sea level. Research indicates that humans cannot live permanently above an elevation of 18,000 feet without suffering a gradual physiological deterioration that eventually leads to death. Mountaineers who anticipate spending time above 18,000 feet must fatten themselves before the climb to offset their inevitable weight loss. Workers at the Aucanquilcha sulfur mining camp in Chile lived for years at 17,500 feet above sea level, and ascended each day to work the mine at 18,800 feet. A settlement in Bolivia matched this 17,500-foot record altitude maximum for permanent human habitation. As of May 2003, National Geographic Magazine reports that 16,730-foot La Rinconada, Peru, is the highest permanent human habitation. **The above figures are averages that apply only to the mid latitudes (45 degrees latitude, North or South). Oxygen available per lungfull also varies slightly by latitude as follows: you will gasp for air about 5 percent harder when climbing at 20,000 feet on Alaska’s Denali (Mount McKinley) than when climbing at the same altitude in the Himalayas. Denali is at 63 degrees north latitude, the Himalaya at 28 degrees north latitude, and the Cordillera Huayhuash at 10 degrees south latitude. Denali rises to 20,320 feet but has the oxygen availability of a 23,000 -foot peak in the Himalayas. The centripetal force of the earth’s spin shapes the atmosphere (and the earth itself) into an “oblate spheroid”, flattened at the poles and bulging at the equator. At a given altitude, oxygen available per lungfull is highest at the equator (0 degrees latitude) where the atmosphere is deepest (such as at Mount Kilimanjaro, Africa), and lowest at the poles (90 degrees latitude) where the atmosphere is shallowest. Peru delights your heart with spectacular mountains, amazing ancient ruins, and colorful cultures. In 2000 and 2003, I enjoyed trekking in Peru to Machu Picchu, Lares, Santa Cruz Valley (in the Cordillera Blanca), and Cordillera Huayhuash. We booked all trekking trips directly by e-mail and fax using the excellent Peru-based company Aventura Quechua. Peru is one of the best exotic travel bargains from the USA (much closer than Nepal). Visitors from the Americas will have little jet lag to Lima (Peru Time PET=EST Eastern Standard Time). See also: my newer PERU 2014 article, when my family group trekked Around Alpamayo in the Cordillera Blanca and did the complete Cordillera Huayhuash Circuit. We trekked the awesome Cordillera Huayhuash, Peru’s second highest range, for 55 miles over eight days, with loads carried by donkeys. We averaged 7 miles and 2000 feet up and down per day. Our camps varied from 10,660 feet to 14,500 feet elevation. We crossed five 15,000-foot passes, the highest measuring 15,700 feet elevation. Visit the important ancient ruins of Chavin (1000-300 BC), a long day trip from Huaraz. Visit Machu Picchu 3 days plus the spectacular Inca Salt Pans at Salinas. Trek 4 days on the famous Inca Trail to Machu Picchu, with loads carried by porters. Trek 3 days from remote Lares to Patacancha (north of Cuzco), with loads carried by llamas and horses. Trek 5 days on the Santa Cruz Circuit in the Cordillera Blanca mountains, Huascaran National Park, with loads carried by donkeys and bus. We avoided altitude sickness by ascending gradually with each trek, walking a total of 85 miles over 12 days, reaching 15,600 feet elevation in the spectacular Cordillera Blanca mountain range. The climate is generally wonderful for trekking in the mountain dry season from May through September. Days are about 65-70 degrees Fahrenheit, and nights about 38 degrees. However, the classic Santa Cruz Trek (near Huaraz) and especially the Inca Trail to Machu Picchu can be crowded in June-July. You will encounter fewer fellow travelers in May or September, which have excellent weather. Many other equally spectacular destinations have few tourists all year, such as the Cordillera Huayhuash trek. Coastal Peru is one of the driest deserts on earth, watered only by rivers descending from the Andes. Coastal Peru, which includes the capital at Lima, has a climate opposite to that of the mountains: a short summer of sunny, sticky days from January to March, followed by 9 months of gray mist called the garua. Visit the Museo Nacional de Antropologia y Arqueologia in Lima. 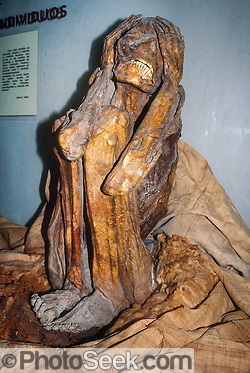 The dry coastal air preserved ancient mummies for up to 1000 years. Flying from Lima to mountainous Cuzco gives a good aerial view of the coastal desert. The attractive town of Cuzco (or Cusco) nestles in a valley at 11,000 feet, and offers impressive Inca history, Spanish colonial architecture, high-quality handicrafts, comfortable lodging, and a pleasant year-round climate. The Spanish name “Cuzco” comes from qosqo, or “the earth’s navel,” in the Quechua language (Kichwa shimi, Runashimi, or Spanish Quichua) Runakuna, Kichwas, and Ingas). In 1983, UNESCO listed the city of Cuzco as a World Heritage Site. Although restaurant touts and craft vendors can be annoyingly assertive around the main tourist areas of Cuzco, you can’t blame them for wanting to make a living. Local products are often of high quality and inexpensive: fresh food, Cusquena beer, woven rugs, decorated ceramic plates, and various handicrafts. As of 2003, the city cleaned up the central square by banning roving vendors and moving them to a covered market building several blocks west. Petty crime is high, but your your body is safer from harm in Peru than in the United States. Hang on to your valuables — one woman in our group lost a loosely secured small camera to a mother with children who distracted her and pressed closely. Be vigilant in cities, and you’ll find Peru to be safe and enjoyable for touring. Easily escape urban problems by trekking and visiting rural country. The campesinos (country folk) are friendly, conservative, and colorfully dressed. Cuzco, the longest continuously occupied city in the Americas, is built upon the foundations of the Incas and several previous cultures. Many of the buildings incorporate Inca walls as a footing several feet high. Francisco Pizarro officially founded Spanish Cuzco in 1534. Santo Domingo Church was built on top of Coricancha (“Golden Courtyard” in Quechua language), Cuzco’s major Inca temple, and was twice destroyed by earthquakes, in 1650 and 1950. At Tambomachay, the Incas diverted a spring through impressive stone work. The Incas perfected stonecraft to a degree which amazes us today. Not even a piece of paper can fit between stones in the finer temples. This moderately strenuous trek through rugged, little-visited country in the Cordillera Urubamba, crosses passes at 13,800 and 14,200 feet between the towns of Lares and Patacancha. A five hour bus ride from Cuzco took us to Lares, where you can soak in developed hot springs. Llamas and horses carried our loads, and we camped at 12,500 feet for two nights. A woman said she weaves for a month on a rug which she sells for only $35 US. Her village is too remote for the government to extend electric lines and she subsists on raising alpacas, much as did her Inca ancesters. We met children who walked 6 miles each way to school. A flock of 30 wild Ibis birds flew overhead. We enjoyed trekking with Aventura Quechua. Visit the ancient experimental agricultural terraces of Moray. Inca Salt Pans at Salinas: Since Inca times, workers have redirected a salt-laden spring onto these extensive terraces for evaporation into salt. At a small mill, workers add iodine to the salt and package it into different grades of purity. Trekking is the most rewarding way to reach Machu Picchu. Or take the train to Aguas Calientes, where a bus climbs to Machu Picchu on the ridge above town (or walk for 1 to 1.5 hours one way). In 1983, UNESCO honored the Historic Sanctuary of Machu Picchu as a World Heritage Site. The Peru National Institute of Natural Resources requires overnight trekkers on the Inca Trail to Machu Picchu to hire a guide and pay entrance fees. Our group of 12 hikers enjoyed great food on a tenting trek with Aventura Quechua who organized 2 guides, 2 cooks, and 22 porters. Trip leader Wilbert attracted us ever higher with his Andean flute. He played several more instruments, spoke eight languages, earned a Ph.D. in Anthropology from a Peruvian university, and had a playful sense of humor. We trekked the standard Inca Trail 32 miles in four days, ascending a total of 8600 feet. A bus took us from Cuzco to the end of the road in the Urubamba Valley at Chilca (railroad kilometer 82), where we met our porters and began walking with day packs on a bridge over Urubamba River. Starting at 7700 feet elevation, we trekked as high as 13,770 feet (Dead Woman’s Pass), before descending on the fourth day to the sacred Inca city of Machu Picchu (8200 feet), where a bus descends to Aguas Calientes. Spaniards passed in the river valley below but never discovered Machu Picchu. At Machu Picchu, climb a very steep, scary, exposed stairway to a great view atop Huayna Picchu, the main peak. Don’t ascend when steps are wet. The Santa Cruz Trek is the most popular trek of the Cordillera Blanca range, which is the highest tropical mountain range in the world, reaching 22,205 feet at the top of Huascaran. We walked for five days in Huascaran National Park, crossing as high as 15,600 feet at Punta Union Pass. Donkeys carried our loads, and we camped at 12,100 feet elevation for one night, 13,800 feet for two nights, and then 13,100 feet on the last night. Read about acclimatization. In 1985, UNESCO listed Huascaran National Park as a World Heritage Area. On day 2 of the Santa Cruz Trek, we walked beneath the ice wall of Caraz (19,700 feet). One of the most spectacular camp spots in Peru (at 13,800 feet) is surrounded by three major mountain massifs with spiky peaks reaching nearly 20,000 feet above sea level. Alpamayo (19,500 feet) must be one of the prettiest mountains in the world, and reminds me much of Ama Dablam in Nepal. Attractive lupine flowers bloomed on spectacular meter-tall stalks in Tingopampa Valley below Punta Union Pass and Mount Taulliraju (19,100 feet elevation). The next day, rain, hail, and snow extinguished our view of Tingopampa Valley as we crossed Punta Union Pass (15,600 feet). Luckily, rain affected us only 2 days out of 23 in Peru (May 19 – June 12, 2000). We descended by bus to Llanganuco Valley and lakes (12,000 feet elevation), in view of Huandoy rising to 20,981 feet, the second highest mountain in the Cordillera Blanca. Hike by waterfalls to scenic “Lake 69” (14,600 feet) at the base of Chacraraju (20,052 feet), and see the immense twin-peaked Huascaran (22,205 feet), highest mountain in Peru. As a long day trip from Huaraz, Peru, take a bus over a scenic 15,000-foot pass to visit the ancient ruins of Chavín de Huántar, at 10,300 feet elevation at the bottom of Cordillera Blanca’s eastern slopes halfway between the Amazon forest and coastal plains, in the Department of Ancash in Peru. 3000 years ago, the innovative Chavin builders engineered the Castillo with underground ducts for natural air conditioning. The most striking feature is the Peidra del Lanzón (“Stone of Lanzón”) or “Lanzon de Chavin“, a 13-foot-high carved white granite stele monument at the meeting point of four underground tunnels in the Castillo (or castle). The Lanzon, the supreme deity of Chavin de Huantar, intertwines the head of the feline deity of Chavin de Huantar and the human body of the shaman of the pre-Chavin period. In 1985, UNESCO listed Chavín de Huántar as a World Heritage Site. Willkahuain is an ancient Wari site near Huaraz, Peru. From 600 to 1000 AD, the Wari (or Huari) people conquered their neighbors in the central Andes. They imposed their way of life on local cultures, and also fashioned strong stone buildings with good ventilation and earthquake resistance. Wari influence gradually wained as local groups regained control. The militaristic and urban culture of the Wari may have influenced the remarkable expansion of the Inca from Cuzco Valley in 1430. Trekking the “Valley Circuit” around the stunning Cordillera Huayhuash requires altitude acclimatization and good physical fitness (but you don’t need to be a climber on this non-technical trail). The Cordillera Huayhuash challenged mountaineers in the gripping 2003 British docudrama “Touching the Void.” Within Peru, only the Cordillera Blanca (Huascaran) is higher. From May 21-28, 2003, I trekked with 10 other men for 55 miles in eight days halfway around the awesome Cordillera Huayhuash. Our route is known as the Backwards C, which is a portion of the complete Valley Circuit of the Cordillera Huayhuash. We hiked across the continental divide of the Andes into the remote upper reaches of the Amazon Basin, then back over the divide to a different road head. Donkeys carried gear and arrieros (donkey drivers) set up camp ahead each day, leaving us to carry light day packs. We averaged walking a moderate 7 miles and 2000 feet up/down each day in beautiful weather. We crossed six passes over 15,000 feet in elevation above sea level (as high as 15,700 feet). The scenery and thin air took my breath away! We took 100 to 120 milligrams of Ginkgo Biloba herb twice a day starting 5 days before ascending, and continued for 2-3 days at maximum sleeping altitude. Siula Grande (20,800 feet / 6344 meters) is the subject of the gripping 2003 British docudrama “Touching the Void.” In 1985, climbers Joe Simpson and Simon Yates scaled the treacherous Siula Grande, one of the last unconquered mountains in the Andes, but after Joe broke his leg, their descent became one of the most amazing survival stories in mountaineering history. We photographed the east face, but they climbed Siula Grande from a valley on the other side (the west face). The movie is based upon Joe Simpson’s harrowing book, “Touching the Void: The True Story of One Man’s Miraculous Survival” (published 2004, 1993, 1989). We exited our “Backwards C” Huayhuash trek in the Cordillera Raura mountains. The source of the Amazon River lies on the east side of the Cordillera Raura, as determined by the Royal Geographical Society in 1950: the tiny glacial lake Laguna Niñococha feeds Rio Lauricocha, then Rio Marañon, then the Amazon. To reach the source of the Amazon, trekkers can depart from the regular Huayhuash circuit near Huayhuash village on Day 7, go eastwards to Caquish, wade across Rio Lauricocha, climb to Laguna Niñococha and finish at the mining town of Mina Raura, on the road head to Churin and Lima (8 days total from Chiquian). You can also hike a complete Huayhuash loop (11 days) or other worthwhile variations. Before, during, and after our Peru trip in 2003, teachers, truck drivers, and campesinos held frequent but peaceful strikes. The campesinos (country people) blocked most major highways with rocks and felled trees, threatening to stop our bus returning to Lima from our Huayhuash Trek. But our energetic guide Koki ran for nine hours round trip to the nearest phone to confirm that our bus had already driven to our meeting point two days early to avoid strikers! President Toledo called a national emergency and cleared the roads, fortunately allowing us to keep our original schedule. Many thanks go to Aventura Quechua, the excellent local guide service (with whom I have trekked to Huayhuash, Machu Picchu, Cordillera Blanca, and Lares). On election eve in May 2000, my wife Carol and I joined the thriving crowds of Cuzco’s night life who bustled without incident around the intimidating police clad in full riot gear who surrounded the main square. Although Peru is officially democratic, the sole opposition candidate, Toledo, protested alleged poll-rigging by dropping out of the presidential race, leaving Fujimori for a third term, making him the most senior leader in the Americas after Cuba’s Fidel Castro. Corruption allegations heightened after Fujimori’s intelligence chief Montesinos was caught red handed on video, and in November 2000 Fujimori resigned from office and fled to Japan. Although he ruled more autocratically than democratically, the United States plus many Peruvians appreciated Fujimori for eliminating the Maoist “Shining Path” terrorist organization, improving Peru’s economy, building schools, and expanding electricity to rural areas. However, Peru’s campesinos (country people) felt more hurt than helped by Fujimori’s austerity programs, and would have voted for Toledo. Toledo rose from poverty to become a Stanford-trained economist, and in 2001 proudly became Peru’s first democratically elected President of Andean descent. Unfortunately, his campaign promises to reduce poverty and create jobs failed to bear fruit. When I returned in May 2003, campesinos, teachers, truck drivers, and health workers were striking (peacefully) every week. One day I witnessed the main Avenue del Sol in Cuzco fill with thousands of peacefully striking teachers (maestros) plus another group. On day 7 of our 8-day Huayhuash Trek, we heard on the radio that campesinos had blocked most major highways with rocks and felled trees for the past 2 days, which might block our bus returning us to Lima. Upon learning this, our energetic guide Koki ran for 9 hours round trip to the nearest phone to confirm that our bus had already driven to our meeting point 2 days early to avoid strikers! Toledo declared a national emergency on May 27 and reopened the roads, allowing us to keep our original schedule. This national emergency put about half of the country under the control of the military and weakened many civil rights, allowing the government to detain protesters and enter homes without search warrants. President Toledo desperately reshuffled his cabinet in June 2003, which did nothing to help his minimal control over Congress. Our three different guides in Cuzco, Machu Picchu, and Huaraz all yearned again for the strong, effective hand of Fujimori. The upper classes in Peru mainly earn their income from exports of gold, copper, zinc, natural gas, textiles, and agricultural products. Strong exports in 2002 gave Peru a trade surplus for the first time in over ten years. From 2001 to 2003, Peru had low inflation, good economic growth, and a thriving black market, at the expense of heavy regulation, worker dislocation, and social unrest. The disparity between rich and poor is very large. Half of Peru lives on less than $2 a day. The “Andean Trade Promotion and Drug Eradication Act” gives Peru preferential tariffs to the U.S. market and boosts agricultural and textile exports, but also suppresses the livelihood of poor Coca leaf farmers, whose traditional product dates from pre-Inca times. Despite turbulent politics, Peru makes a wonderful vacation. Allow two extra flex days in your schedule to handle delays in transportation due to frequent strikes.